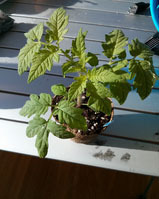 This is a determinate tomato at 63 days for maturity, it grows into a bushy plant with cherry size tomatoes. It’s good for indoor growing, so that is where I am growing it. 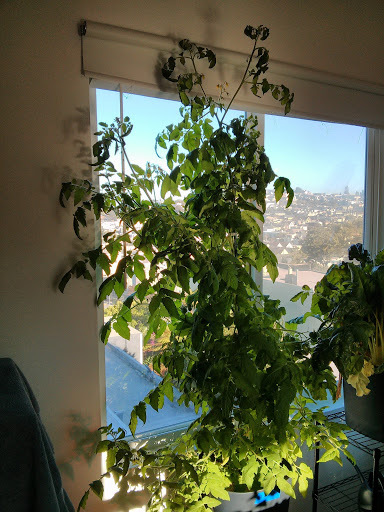 I put it into a self-watering 3 gallon pot from Ikea, which I love. It took 7 days to germinate. At day 17 I transplanted it to a compostable 3″ pot. At day 30 I planted it in the 3 gallon pot. At day 37 we left on vacation for two weeks. It was about 12″ tall, and very healthy. What we came back to on day 55 was a monster of a plant. It was very bushy, and full of flowers, only problem was that its weight had snapped the main stem 2/3 of the way through at the base of the plant. While we were gone it had grown so much and there wasn’t anybody to take care of it, to tie it to a stake or anything for support when it needed it. I could have tried to see if 1/3 of the stem would be enough to sustain it through fruiting, but it was likely to get more damaged and die. I will be growing this again from seed very soon to see how it grows at various times of the year. For now, I am rooting several branches in water along 10″ of their stems to replant and see how well rooted branches will produce, being a determinate, it is likely not to be nearly as much as a full plant. I also cleaned off the main branch that was severed and replanted 16″ of it in hopes that it will root and somewhat recover as well. Time to restart this experiment! 65 days: The branches in water have developed roots yesterday, well, two of them. The potted main stem seems to be coming back to life. Most of the flowers have died, but the pneumatics of the plant are becoming stronger, and the stems rigid again. There are several tomatoes growing, probably pollinated before the stem broke. 66 days: I planted some more seeds in the same pot, just in case the lifespan of the current one is cut short. 74 days: The main plant has recovered, and is making new blossoms. I took the cuttings that were rooting in water, and planted 4 of them in a new container. 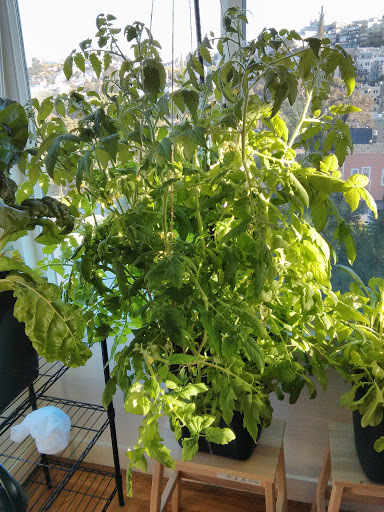 107 days: We have now harvested several tomatoes from the main plant, it is now close to 6′ tall. The flavor is your standard cherry tomato, nothing exciting. Given the size of the plant, being a “determinate”, and the flavor, this isn’t a good choice for indoors. I probably won’t grow it again. Day 168: Both pots of the Alaska have reached the end of their viability. These plants produced a combined total of 6.7 kilos of tomatoes, 299 individual tomatoes at an average of 22 grams per tomato. If the collapse of the plant and subsequent rootings of its existing parts had any effect on the quantity of tomatoes that were harvested, I’d be surprised. 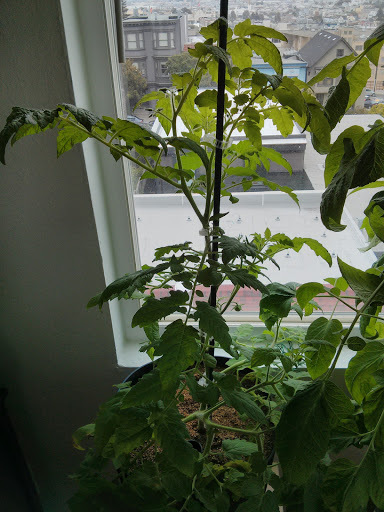 In the end I decided not to grow another Alaska plant; its size was too much for the indoors, and dwarf tomato plants sound much better and more interesting for the next indoor varieties.